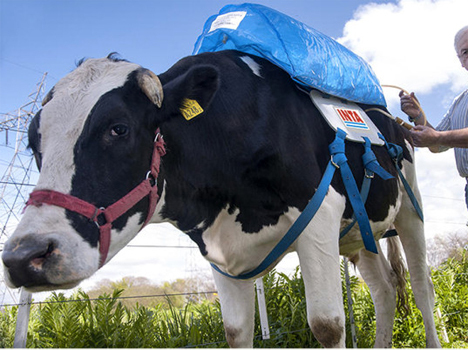 Can Harvesting Cow Gas Slow Global Climate Change? Humans have no doubt contributed to climate change, but one of the biggest culprits is actually the methane released by cows. 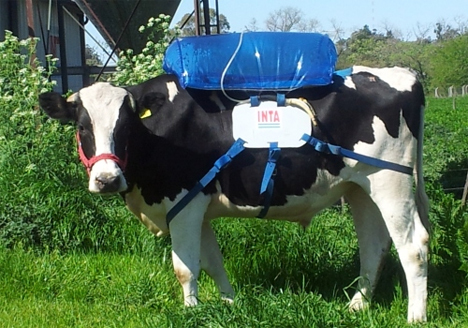 Researchers at Argentina’s Instituto Nacional de Tecnologia Agropecuaria (INTA) want to harness that methane as a clean, renewable form of biofuel – by having the cows wear fart-collecting backpacks. 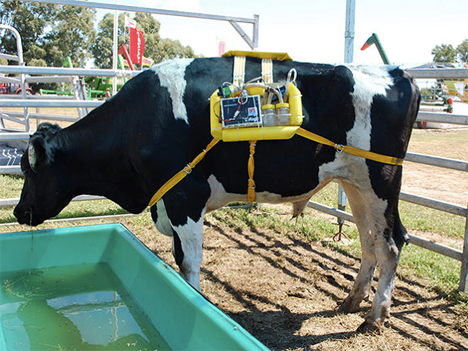 To collect the methane, a tube is inserted into the cows’ rumens (an interior part of the digestive system) and routed up to the gas-catching backpacks. Each cow produces somewhere around 300 liters of methane per day, which the researchers say could provide enough energy to operate a refrigerator for an entire day. After the gas is collected, it is purified and condensed to create usable biofuel. There are some ethical dilemmas at play in this plan since the collection tubes are inserted through the cows’ skin using a local anesthetic. However, this measure may be acceptable and even necessary if it makes a significant change in the amount of harmful gasses that are released into the atmosphere. The method not only stops the methane from being released into the environment, but also provides a clean and renewable source of energy for nearly anything that requires fuel to operate. However, we hope that a far more humane method can be developed to eliminate the need for an intrusive and painful tube sticking through the side of the cow’s body.